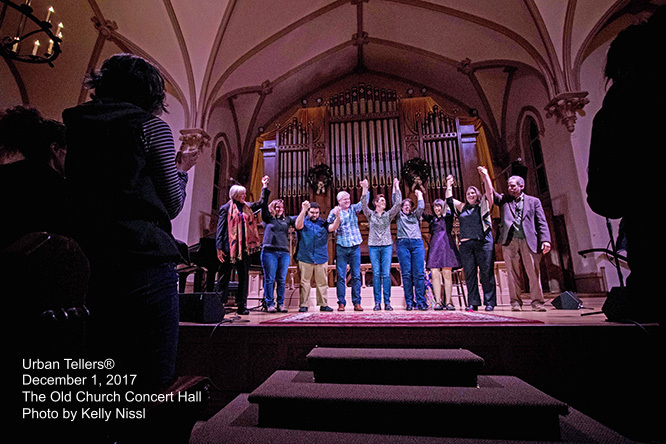 Standing ovation at The Old Church Concert Hall on December 1, 2018 Urban Tellers. It was a standing ovation at the Old Church Concert Hall on December 1st, for storytellers and hosts Lynne Duddy and Lawrence Howard. 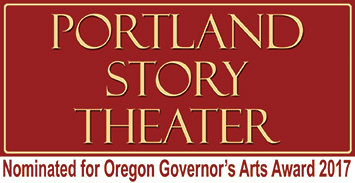 Their December 1st event was one of the many that Portland Story Theater hosts each year. (Photo credit, Kelly Nissl). The nonprofit is the Pacific Northwest’s premiere storytelling organization and is in its year-end fundraising drive. CLICK HERE to visit their page. Our vision is to advance, inspire and expand our community narrative, one story at a time – and in doing so, preserve and promote the ancient art of storytelling in a way that enriches modern life, allowing and encouraging people to be vulnerable and present in ways that are crucial to the full expression of our humanity. Portland Story Theater builds community, promotes understanding, and fosters radical empathy by giving voice to the real, true stories of ordinary people. A 501(c)3 Nonprofit Arts Organization, Portland Story Theater is a passionate advocate for diverse narrative and our loyal listeners. We are a 501(c)3 charitable organization. Contributions and sponsorships facilitate outreach and keep ticket prices affordable. As an advocate for the narrative art of storytelling, Portland Story Theater strives to broaden audiences, develop new approaches, and support existing and new storytelling programs. [EIN #27-0670834] Your kind Donations are appreciated. Portland Story Theater builds community through story. Our work gives voice to the true stories of ordinary people. We break down barriers and stereotypes by bringing people together to hear real, true stories. We teach people that telling their personal story is a process that ignites self-discovery and nourishes our capacity for empathy for ourselves and each other. Our work at Portland Story Theater fosters a deep awareness around the idea that the more personal a story, the more universal it becomes. This art form is the spontaneous unfolding of a story that is celebrated onstage; in the moment, in the shared space between the listener and the teller. We work with other like-minded people to co-create live storytelling shows. We are low-tech, no-frills theater. We tell our stories directly, never asking the audience to suspend disbelief. This is a return to the ancient roots of theater. This is theater at its most basic, essential, elemental core: performer, audience and words. Telling our stories face to face, eye to eye, and heart to heart. Portland Story Theater makes stories provocative, inspiring, and accessible to everyone, young and old, of all social backgrounds, and ethnicities. Be heard. Honor your emotional truth. Discover your self through story. Discover your history.Listening builds connection. Be open. People are transformed by being heard. Listen openheartedly. Story breaks down barriers. Be vulnerable. Tell your story. Authentically. Honestly. Sincerely. We are in a revolution. Be a part of the change. Story illuminates the universal through the personal. Story awakens our consciousness. Story helps us recognize that we are one race, the human race. Believe. Act. Transform. We believe that personal story breaks down barriers and reveals the commonality of the human experience. We believe that story is the glue that holds us together and sustains us as a community, that story awakens our consciousness and helps us recognize that we are one race, the human race. Support the work of Portland Story Theater in our community!